Officers Jared Cabatu, left, and Erich Jackson pose with Deputy Chief Paul Ferreira. 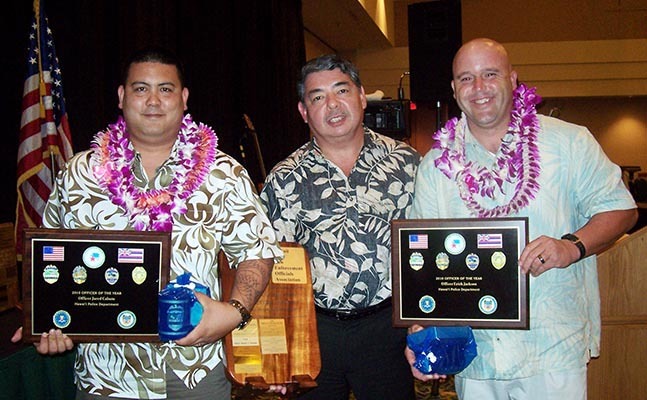 The Hawai’i State Law Enforcement Officials Association has named Officers Jared Cabatu and Erich Jackson as the Hawai’i Police Department’s Officers of the Year for 2010. The officers were honored for talking down a juvenile male who was threatening to hang himself from a church rooftop. 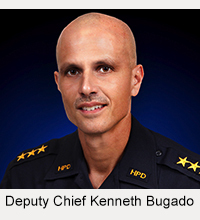 Both officers climbed a ladder onto the roof and established a rapport with the boy, eventually persuading him to untie a rope from around his neck that he had attached to a beam. 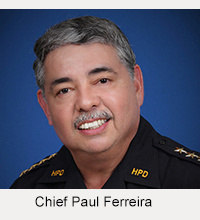 The HSLEOA award was presented September 24, at the Kauai Marriott Resort.